Greater Portland METRO initiated Project FAST: Forest Avenue Smart Travel to create new travel options on one of Portland's busiest corridors, Forest Avenue. 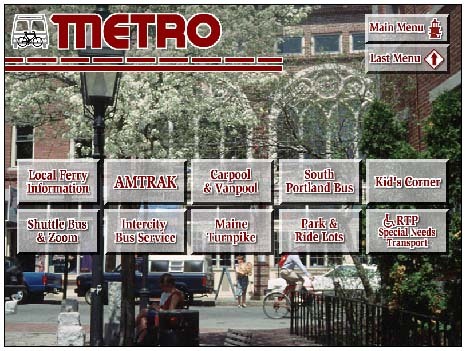 Project FAST is a major feature of the Portland Transportation Plan. Developed by a diverse group of citizens and adopted by the City Council, the plan is a blueprint for a more livable and economically vibrant region. FutureTouch is responsible for the deployment of several "smart" information kiosks that use exciting interactive computer technology to assist commuters with travel schedules and options.